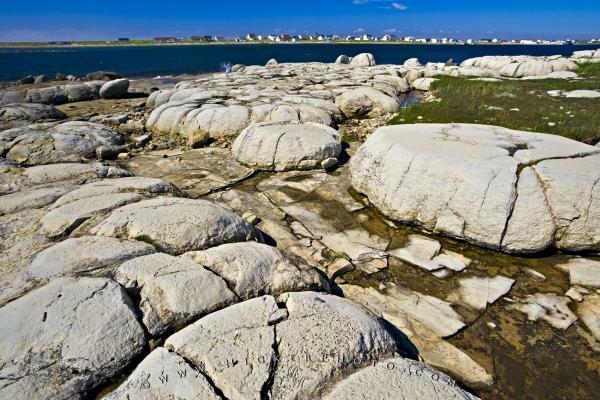 Being one of the few places on earth to see thrombolites, the small town of Flower's Cove on the Great Northern Peninsula of Newfoundland, is a must see for fossil hunters. Scientists believe that thrombolites were formed over 3,500 million years ago and are the earliest forms of life on earth. Thrombolites are created by single-celled bacteria who deposit and bind layers of sedimentary grains that slowly grow into rounded rocks. These ancient fossils are found only in Flower's Cove in Newfoundland, and Western Australia. Photo of thrombolites in the town of Flower's Cove on the Great Northern Peninsula of Newfoundland. Pictures from photo gallery "Viking Trail"
This picture is part of the photo album "Viking Trail" - there are more beautiful images waiting for you.